Albert Charles Ricketts was born in the summer of 1898 in Yeovil. He was the son of glove cutter Sidney Albert Ricketts (1873-1911) and Alice Louisa née Patten (1875-1909). Sidney and Alice's children were Alice Mabel (1896-1976), Albert, Ethel Louisa (b1900) and William Stanley (b1906). By the time of the 1911 census Albert's mother had died and he was living with his father and siblings at 70 St Michael's Road. 13-year old Albert was working as an errand boy at the Whitby Brothers' glove factory. Later in 1911 Albert's father also died, and Albert moved to Melksham, Wiltshire, where he worked in a saw mills. Albert enlisted at Devizes, Wiltshire, in April 1915 when he was only aged 17. He joined the 13th (2nd Rhondda) Battalion, Welsh Regiment. His Service Number was 55040. In July 1916 the 13th Battalion were in action at Mametz Wood on the Somme, suffering severe casualties. They did not return to major action for more than a 12 months. Albert was drafted to France to join his battalion early in 1917 as the strength of the unit was increased after Mametz. The 13th (2nd Rhondda) Battalion, Welsh Regiment, including Albert, took an active part in the Battle of Passchendaele (or Third Battle of Ypres). This comprised a whole series of battles that took place on the Western Front, between July and November 1917, for control of the ridges south and east of the Belgian city of Ypres in West Flanders. Passchendaele lay on the last ridge east of Ypres, five miles from a railway junction at Roeselare, which was a vital part of the supply system of the German Fourth Army. While engaged in the various battles that comprised Passchendaele, Albert was severely wounded in the thigh. Upon recovering, he rejoined his battalion at the front line. 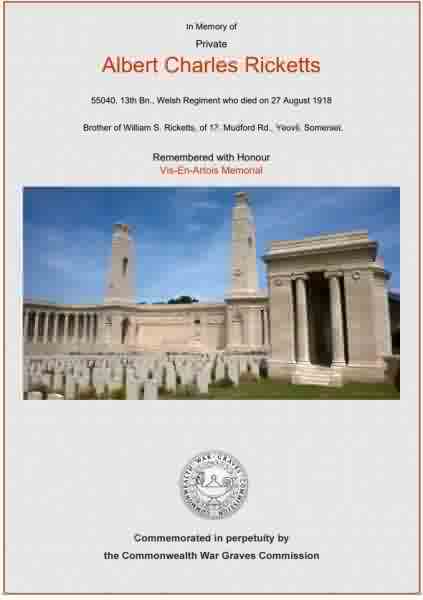 On 27 August 1918, after having been involved in the Battles of the Hindenburg Line and the Final Advance in Picardy, Albert Ricketts was killed in action by a machine gun bullet during the day-to-day trench warfare of the Somme Offensive. He was aged just 20. In its edition of 11 October 1918, the Western Gazette reported "The death is reported in action on August 27th, of Private Albert C Ricketts, Welsh Regt. His officer writes that he was killed by a machine gun bullet during the recent advance and that his death was instantaneous. He joined the Wilts Regiment in April 1915, when only 17 years of age. Early in 1917 he was drafted to France and has since seen considerable service, being severely wounded in the thigh in September of last year. He was 20 years of age, and at the time of enlistment was living at Melksham, being employed in the Saw Mills there. Previously he had been employed at Messrs Whitby Bros’s factory." Albert is remembered on the Vis-en-Artois Memorial, Panel 7, Pas de Calais, France, and his name is recorded on the War Memorial in the Borough. The Commonwealth War Graves Commission certificate in memory of Albert Ricketts.